Affordable housing plan for North Cerney is the perfect Christmas gift! Residents in North Cerney are celebrating Christmas early with the news that Cotswold District Council has approved a scheme which will see 12 new affordable homes built in the village. The scheme, submitted for approval by Cirencester Housing, will benefit from a grant of over £480,000 from CDC, and will provide a significant boost to the local community when it delivers ten rental homes and two shared ownership homes providing much needed accommodation for local families. Construction is expected to begin next year and the houses should be completed by Spring 2019. “Affordable housing will maintain a balanced community, breathe fresh life into North Cerney and should help ensure that local people can stay living in the village they call home. A Planning Application has now been submitted by Cirencester Housing for 12 new homes on the land between Churnside and cross roads on the A435. Those who attended the public meetings will be aware that it is intended to build a mix of houses and flats to meet the affordable housing needs of North Cerney and Bagendon Parishes. 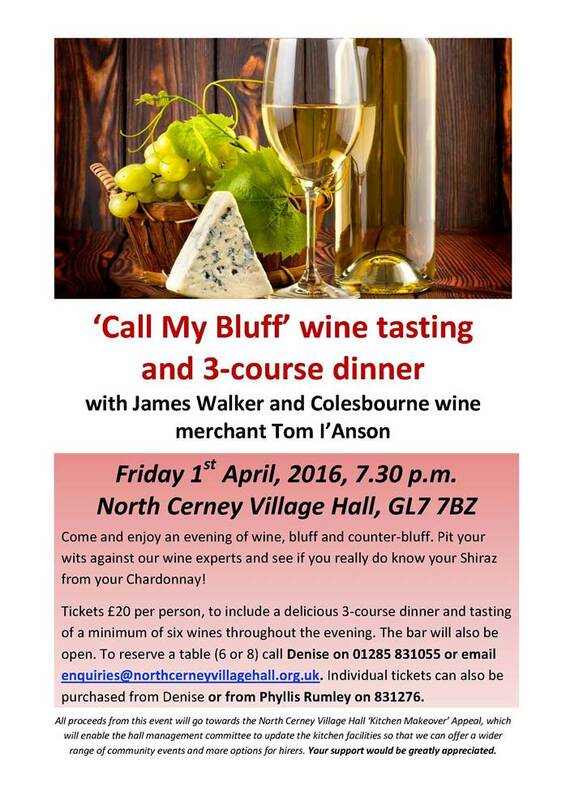 Our next community get-together in North Cerney Village Hall is another Call my Bluff Wine Tasting and Dinner, courtesy of James Walker and Tom I’Anson, our friendly Colesbourne wine merchant. We had a great time at this event last year and couldn’t wait to repeat it. Details below, so do come along and enjoy a wonderful evening. I thought I would let you know that, thanks to a whopping grant from Gloucestershire Environmental Trust, a hugely important amount from Cotswold District Council, a donation by North Cerney Parish Council, and your support for our hall events, we will be re-roofing the hall from 14th April to 4th May. The hall will remain open throughout and we hope there will be minimal disruption to those living in close proximity. Once the new roof is on we will be having a couple of working weekends at the hall to give it a spring clean and to do some other internal and external jobs. We’ll advertise the dates and hope you might be able to help for an hour over one or both of the weekends as we do find that many hands make light work! Thank you. Anyway, first things first. Join us on 1^st April for supper and numerous tipples!